Hey, a really nice trainer. I saw mouzMaNa playing it on his stream. However good it may be, I am using custom hotkey bindings. Does anyone know how to import custom hotkeys to singleplayer mods like this one without having to manualy reassign every key? I love this one :D.
"..it all comes thumbling down thumbling down thumblin down"
Hey sorry if this has been said. But when i try and paly it (EU) the game speed is set to slow. All the settings are locked and I cant change any. Am I doing something obviously wrong? i just have mine set, then use create game... it should carry over. i would enjoy a proxy gate zealot vs zealot or a 4gate micro challenge... i'm sure zergs could use a ling/bling mirror match trainer, and terrans could use a vs terran bio/tank/viking and full mech micro. "think for yourself, question authority"
To the people suggesting extra challenges: you have to understand that those currently ingame, are actually very easy tasks for the cpu to perform (mostly, amoving), or very advanced and borderline impossible to beat (the blink stalker vs blink stalker mirror). Anything in between would be extremely hard to program...say, ghost vs ht, or ling/baneling mirror. Either a cpu plays perfectly or amoves simply because it can do stuff a LOT faster than any human. Is Darglein making any new challenges? I'd like to see storm dodging. I always train on this one, It's the best. Thing is it's in normal or slow speed on EU? Where can I find the fastest speed one on EU? It's a really good map, I play it a lot on NA so lots of cred too you good sir! "I'm a creepy guy. 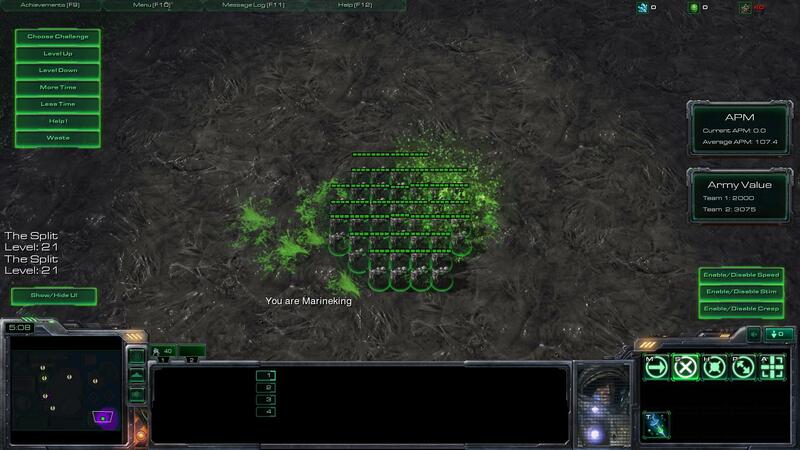 Tasteless, if it would make my units move faster, I would peek in everyones window in Seoul." it should usually be on "fast" by default. if you use create game, there should be a speed setting in the game lobby. change that to "faster"
unfortunately, it will do this almost every time. QUick question for the Creator IS EVERY level OF every 1 possible ? It's amazing that the amount of news that happens in the world everyday always just exactly fits the newspaper. Hi realy realy good map: I'm using it for a long time now. Could you give more space for cameras. On some challenges you are at the edge of the map. not being able to scroll more to the left or xy side. Which is unnatural and hindering sometimes and you don't want to learn the map you want to learn natural micro. As reading about the ideas of creating more challenges: here is my "demand"
@grimzzy hehe, of course not. he just added algorithms for unlimited levels. Testing each challenge to be possible for each level would be too much work. And I like the unlimited levels. You can just always increase. - But sometimes it's more about learning the AI behaviour than microing - for example baneling sniping on 20+ its later better to split 100%... yes the sense is to try improve sniping but just sayin..
@itisis next HuK? Hm, I reached 4x+ speed but no creep . because on creep you need tanks :D I'm not playing terran anymore so I don't train this. And it makes your hand hurt^^ Does your one hurt? ^^ Day9's 5 hand-stretches help. He can still adjust the numbers of enemies. Which sets the diffuculty - even if he snipes you, sniping has a minicooldown which makes it possible for you to train feedback. more for a-move. less for microed-caster units, nevertheless a protoss-AI casting storm is never perfect unless you programm him "baiting" :D So those challenges are still relativly easy to create. hm, I have faster by default..
Just dropping in to say thank you for making this map. Spending a lot of time doing the challenges and learning a lot.